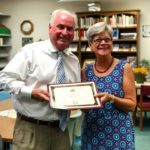 On June 26, 2018, Karen Stott Bersche was recognized as a 2018 Illinois Library Luminary Recipient by Illinois State Representative Dan Brady. Karen served as the Director of Towanda District Library from 2008-2018, and she will be formally presented with this prestigious award at the Illinois Library Association’s Annual Conference in October, 2018. Donations in honor of Karen’s achievement are welcome. Checks can be made payable to “Towanda District Library” with the phrase “Luminary Donation” in the memo field.